We can offer a number of self contained short term apartments available for a short or long stay in the New Farm offering convenience and lifestyle. 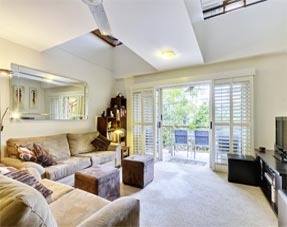 The Powerhouse Apartments and Terraces complex is situated in New Farm, an inner city suburb of Brisbane, 2 km east of the CBD and is one of Brisbane’s trendy, café hot spots. New Farm is one of the most beautiful suburbs in Brisbane, full of energy, fabulous shopping and an array of dining cultures. New Farm is surrounded by the Brisbane river with access through Fortitude Valley, Teneriffe, Newstead and at the south-eastern end (5 mins from the building) is the historic New Farm Park. Brisbane airport is approx 12 km away and easily accessible by train or taxi. Transport is within walking distance with the city cat (ferry) and bus every 10 mins with the city centre just 2 km away so a taxi is another inexpensive option. New Farm library is also a stone’s throw away. New Farm encourages an outdoor lifestyle with tree lined streets and unique spaces like the Brisbane Powerhouse, an arts and performance space also offering riverfront dining. Just down the street is the shopping precinct called Merthyr Village offering an array of trendy cafes, restaurants and shopping. There are also a wide variety of businesses operating along Brunswick Street and adjacent streets catering to all your business needs. The heart of the suburb is historic New Farm Park right on the Brisbane river and visible are the sparkling lights of the CBD. It’s popular with the locals for walks and on the weekend catching the river breezes and hosts a farmers’ market on the second and fourth Saturday of each month. A nearby fashion mecca is James Street offering high end fashion boutiques, trendy watering holes, cafes and a movie theatre that screens fabulous foreign films. There’s also a great gourmet food market.